إذا كنت تبحث عن فندق بموقع جيد في بورت فيلا، فقد وجدت ضالتك في Poppys On The Lagoon Resort . إن موقع الفندق الاستراتيجي، الذي يبعد 2. Km فقط عن مركز المدينة، يسمح للنزلاء بالوصول سريعاً وبسهولة إلى العديد من الوجهات المحلية المثيرة. يضفي محيط الفندق اللطيف وقربه من فيلا سنترال هوسبيتال, نتينل موسوم أف فانواتو, بلمس كازينو سحراً خاصاً على هذا الفندق. إن الخدمات التي يقدمها Poppys On The Lagoon Resort تضمن للنزلاء إقامة مريحة. تتضمن الميزات الرئيسية في هذا الفندق: خدمة التنظيف يوميًا, متجر هدايا/تذكارات, مطبخ, مرافق مخصصة لذوي الاحتياجات الخاصة, واي فاي في المناطق العامة. في الفندق غرف نوم يتجاوز عددها 31، كلها مجهزة بعناية وجمال وبعضها مزود بـ تلفزيون بشاشة مسطحة, اتصال لاسلكي بالإنترنت, حوض الاسترخاء, غرف لغير المدخنين, خدمة الإيقاظ. يقدم الفندق العديد من الفرص للاستجمام كمثل كنو, الغوص السطحي, شاطئ خاص, مسار جولف - ضمن 3 كم, حمام سباحة خارجي. استمتع بخدمات لا يعلى عليها وعنوان ذو اعتبار في Poppys On The Lagoon Resort . You feel a world away from town when at Poppy’s. This nice and quiet location has very friendly staff that are more than happy to go out of their way to help you out. Accommodation is nice, clean & comfortable, we were lucky enough to receive an upgrade to our room, which was great. All in all we had a great stay at Poppy’s, just be ready to trek up the very steep driveway to catch a bus..! Close to everywhere, only cons is the resort is located down to the hill foot, could be difficult to access by car if you drive your own, but if you go with a taxi there is no problems at all. Inside the resort is really beautiful. Truly friendly staff who go out of their way to help with your trip. And they all remember you by name! Close to town, only minutes away by bus. Faces a beautiful lagoon. Facilities were terrific, love the self-service canoes. Minor gripe with my room fan, which only had two settings: Very slow, or very fast and super noisy. Bed would benefit from a mosquito net too. This was our great stay for our family with young kids. The staff really made all the difference. Not so good was the quality of food at the reasonably expensive onsite restaurant. 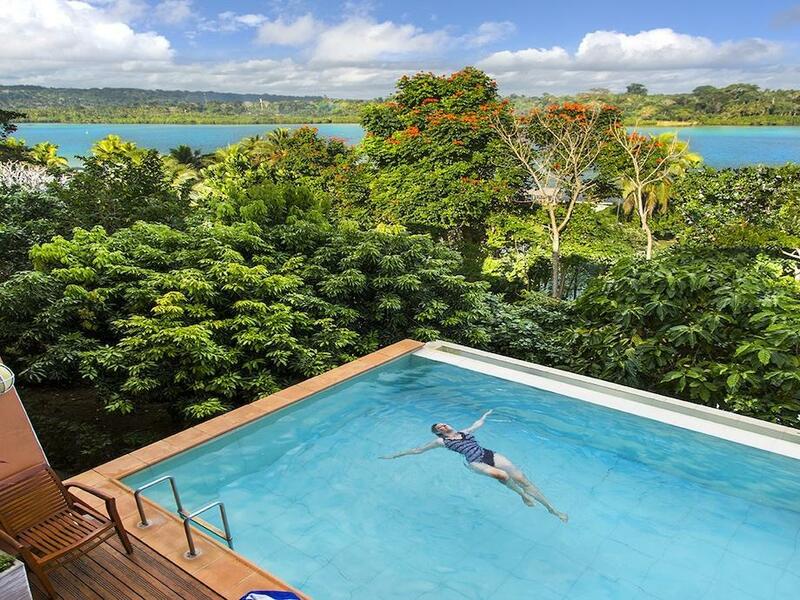 I travelled to Vanuatu for a conference. Great things are as above. The staff although overwhelmed with the influx of people checking in were friendly. Continental breakfast was lovely with a selection of pastries and fruit with Vanuatu coffee. Things to be aware of: 1 the roosters crow at all hours of the night so if you're a light sleeper, take your ear plugs.i didn't hear them on the last 3 nights 2. There is no air conditioning but the studio rooms were wonderfully cool and I had a sensational view of the lagoon. 3. Buses in Vila are a great way to get around and cost a fraction of taxi fare. People are friendly, helpful and I felt safe once I had travelled a little within Vila. All in all worth the stay! 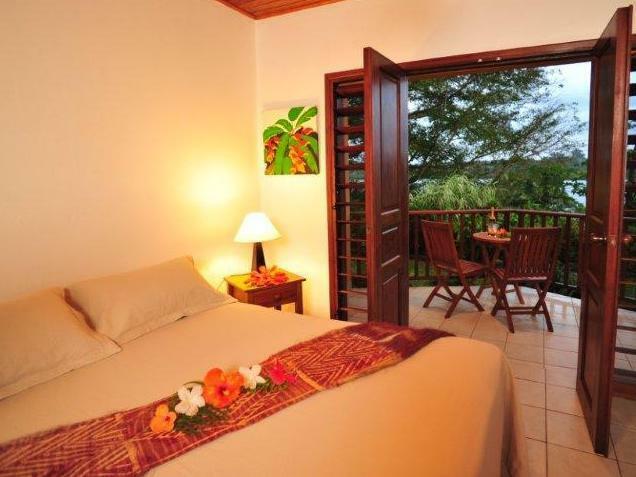 Quiet & rustic feel, Island night allowing tourists to experience local party, friendly staff. Stay was ok, no drama. Could easily communicate with staff in english. 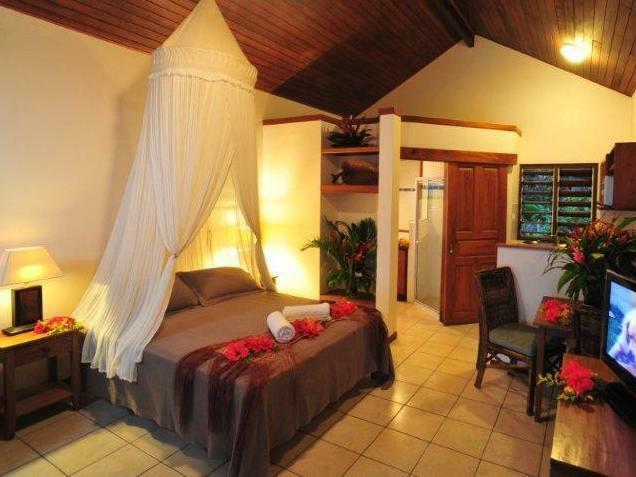 Alittle overprice considering the condition of room, but probably price is for the resort and rustic feel being offered. The staff, the gardens and the comfortable room. The staff were very friendly and very helpful in organising tours and giving advice on the best things to do. 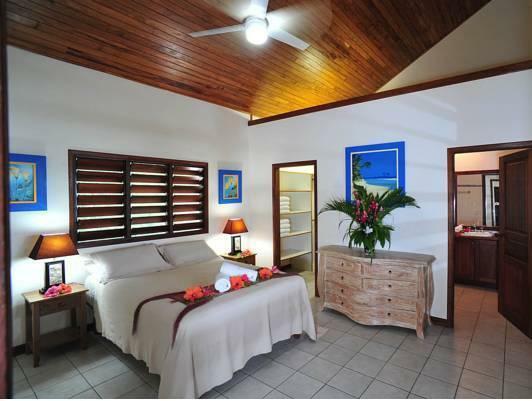 The rooms were attractive, clean and comfortable and serviced daily. You can walk to town from here and there is a large supermarket nearby. I would recommend Poppy's unreservedly. 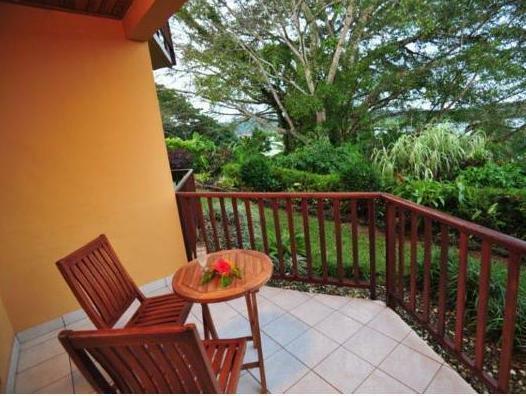 One of the best places to stay in Port Vila, our self contained villa which included a spa,tv and a view to the river. The staff are very friendly and most helpful. 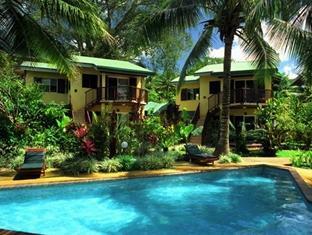 The gardens are beautiful and well maintained and boasts 2 swimming pools. We enjoyed our stay there very much and would not hesitate to recommend. We had a nice stay at Poppys, beautiful garden and the view of the lagoon. We had the Studio Lagoon View it was very nice it has everything we need. Although i have negative to say about Poppys, They should provide Shampoo, coffee or tea instead of us having to buy it. They should include that into the cost of the room. People want conveniences. And Oh Poppys had a steep driveway but we didn't mind that. Quiet but close to town. Lovely place to stay. Especially the Beach Bungalows. If you don't like walking up very steep hills it would be advised to stay in the vilas half way up the hill. Staff are lovely and willing to assist. Food was good and the Melanesion Night is a must - the food is delivious. 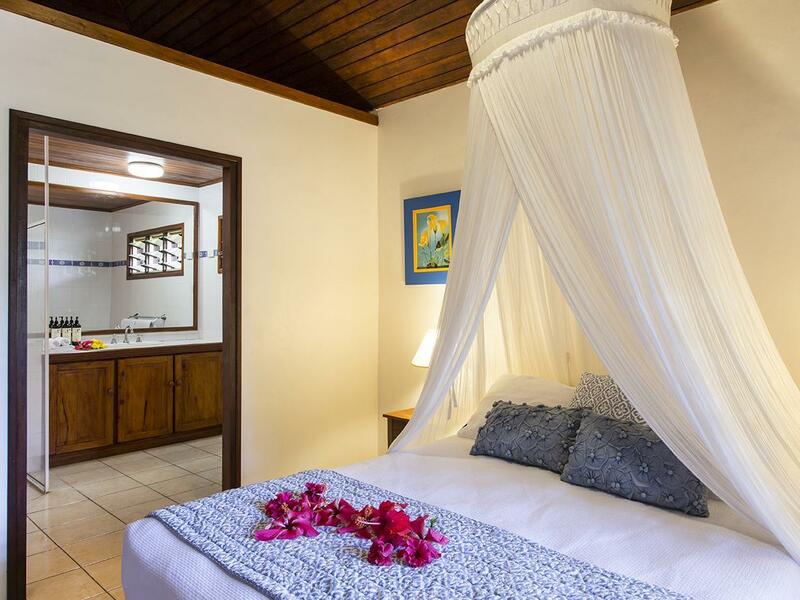 Very clean and comfortable, quiet and relaxing. I would definately recommend this hotel if walking up and down steep hills (the driveway) doesnt bother you. Pas de wifi dans les chambres ou alors payant ce qui n’était pas convenus lors de la réservation. Belle vue mais moustiques envahissants. Après 2 nuits sur place nous avons trouvé beaucoup mieux pour pas beaucoup plus cher 400 m au dessus. Personnel très avenant, toujours à votre service. Chambres agréables et très propres. Emplacement idéal, calme au bord de la baie et à 10 mns à pied du centre ville.